Using glaze as a medium with acrylic painting can create several effects in your artwork. Glaze is a clear, milky fluid that works well with acrylic paints and can be used to make the paint shinier, thinner or used as a varnish. Glaze has a thick, watery consistency, much like liquid acrylic paint. It is not wise to add water directly to acrylic paint to thin it out, as this will not mix well. Add water to your glaze, allowing it to thin, and mix the thinned glaze with your paint, creating a lighter consistency. After your acrylic painting is complete, use the glaze medium as a varnish to protect and brighten your work. 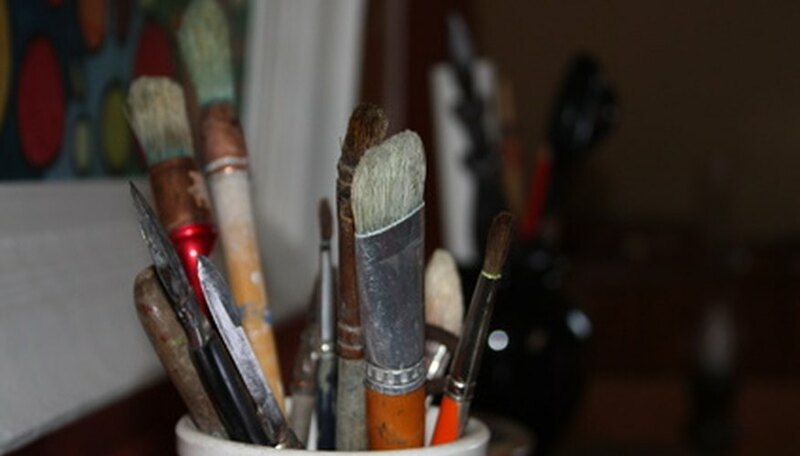 Paint a thin layer over your artwork with a paint brush. The end result will appear shiny. Add the glaze to a textured medium acrylic to create rough effects on your painting. Using a resin sand glaze will bring a rough, raised feeling to your painting. Add black lava glaze to your artwork to achieve a black speckled look.